Chickpeas and Swiss Chard in the Style Tunisian Sahel, Blogiversary and a GIVEAWAY! My first American cookbook author love, the much revered icon Paula Wolfert. As you can tell from my blog, I am partial to food photography just a smidgen but what I end up falling in love with are books and an author of substance. My first purchase of her books was Couscous and Other Good Food from Morocco without a single photograph as you leaf through the pages. Paula Wolfert's words paint such beautiful pictures of faraway exotic places, souks and bazaar and alleys which lead you into homes and give you windows into kitchens of old and new world artisans whether in Marrakesh or Istanbul. Her recipes take you through amazing narrative and culinary journeys. Of course I was happy when I saw her later works and the beautiful food photography that goes with it. 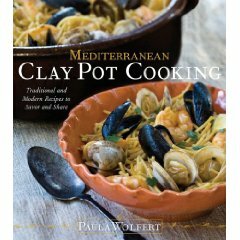 I own most of Paula Wolferts books, but the most recent one, and as you can imagine my delight when Paula and her publisher at Wiley Publishing, agreed to donate not only a review copy for me, but also, not one, but two copies of her most recently released book, Mediterranean Clay Pot Cooking. It was also a great excuse for my way ovedue purchase of a clay pot! Now that I got the book I had to have a tagine to go with it! 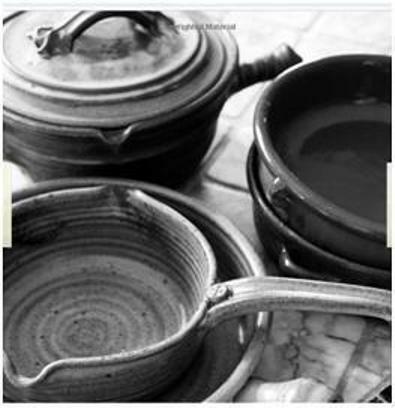 As I am reading Mediterranean Clay Pot Cooking's introduction, I am reminded why I got entangled in her culinary story telling web in the first place! Please visit Paula at her site. 1. 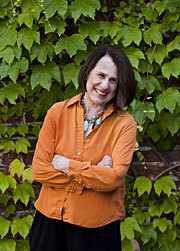 Please follow Paula Wolfert on twitter @soumak. Disclaimer: I received the review Mediterranean Clay Pot Cooking copy and two extra giveaway ones at no charge, and was not solicited for my opinions or my review. 2. Please follow either @foodwanderings on twitter or LIKE foodwanderings Facebook page or both. If you are already a follower, see step 3. 3. Leave a comment on this post! You are encouraged to share a comment about Paula Wolfert's recipes or books or any other thoughts. 6. Shipping only in the US. Sorry my friends overseas, but I hope one day I can afford the mailing. 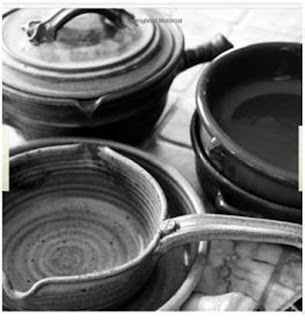 There are so many recipes I want to make from Mediterranean Clay Pot Cooking. Should I make the Grape Leaves Stuffed with Rice, Rose Petals, Currants and Mint, which will be perfect for holidays first course or New Year's eve cocktail party. Should I skip directly to dessert and make the Crema Catalana, or a soup, Moroccan Harira. I was also tempted by a couple of Corsican and Sicilian dishes as well as simple waxy potatoes called Baby creamer Potatoes Cooked in Devil's Pot. Couple of nights ago a side of green was needed, as it happened I had chard and the ground coriander added was a nice dimension to this Chickpeas and Swiss Chard in the Style Tunisian Sahel (Morshan) recipe here. What a great giveaway! And Happy Blogiversary to you! I just followed Paula on Twitter. I just "liked" you on Facebook. Ironically, I tried my first recipe from Paula just last week! It was a recipe for salmon with eggplant and pomegranate that I found on another blog. It was absolutely delicious and I would love to own one of her books and have a chance to try more of her Mediterranean recipes - it's definitely one of my favorite cuisines! Happy Blogiversary Shulie!! May the good Karma start a brand new tradition - LOVE YOU GIRL!!! And finally... I just tweeted about the giveaway. Thanks again for doing this! Happy Anniversary to you! Cheers to good Karma! If you believe it, it will be! Happy Blogbirthday to you, darling! Wonderful little place you have here and no disasters in sight! Love this kind of cooking, absolutely, and we cook like this often at my house. What a wonderful book it sounds and I'd love to have a copy. DO I add a comment to say I follow both you and Paula on twitter! Now following and tweeted the good news. I fell in love with this book, and Paula's writing, the moment I saw it at the library. Checked it out and read through the entire book...I'd love to add it to my cookbook shelves and cook my way through it. Congratulations on reaching your milestone!! I love Paula's books. I have been "coveting" this one for a while. (I follow her and YOU, and RT'd this post). Happy Anniversary! I've been interested in clay pot cooking after visiting San Miguel Mexico a few years ago. Have been thinking it is time to learn more. Just RT about the giveaway. Happy Blogiverary! I love Paula's cooking and always wanted to try my hands with clay pots. This will be a great incentive if I get the book. Please, pretty please. Happy Birthday! err, Happy Blogaversary! I hope you have a great week! You know I love you, your blog, your recipes, your humor... and I love this giveaway! Hope I have the opportunity to cook some of these dishes! Happy Blogiversary, Shulie! Sounds like a wonderful book! I RT the heck out of this post, which means it should count at least 10 comments. Can you smell my desperation? Wow, I love mediterranean cooking and I would LOVE to get that cookbook, it looks amazing! Hmm... well I was following you on twitter before, and now I just re-followed you, and also tweeted about the giveaway. Lovely post! I follow you and paula and am looking forward to seeing some more of the recipes from the book! Congratulations, Shulie! Happy blogiversary! I just became a fan of your Facebook page! And I'm actually following Paula Wolfert in Twitter, too! I've heard great things about her and her cookbook and it'd be very cool to win the giveaway!! :-) Congratulations and best wishes for more years of your blog!! Happy Tuesday, Kali! I was staring at a photo of an Emile Henry Stove Top Clay Pot last night. It's a GOOD omen. My eyes twinkled when you revealed your nickname. Kali, on the other hand is very important in my culture. It's our martial arts. If you've seen the Jason Bourne movies, Matt Damon's hand to hand combats were primarily based on kali. Well, Shulie that is indeed a wonderful post. I am already following you on TW and Facebook and the same with Paula Wolfert (she is on TW). I have P Wolfert's, The Cooking of the Eastern Mediterranean and really like it. Partly because as a vegetarian I need and love tasty recipes and I also enjoy the way she writes about food. Oh... I have the pot, now I just need to know how to use it. Pick me! Pick me! Over at Chowhound, our Cookbook of the Month are two Wolfert books: World of Food and The Cooking of Southwest France. There is a lot of confit being made. OOoo I love Paula Wolfert's books. I am slowly collecting them. I think The Slow Mediterranean Kitchen is one of my favorites. The pork coddled in olive oil over white beans and arugula is to die for! I RTd your tweet on Twitter too! Yk, I've had buying a tagine in the back of my head for awhile now, I love tagine dishes! Cheers and may you have many more blogiversaries to come! First, I want to comment about how beautifully written this post is! Thoroughly enjoyed reading it. And third, can't wait to try this recipe. I love Swiss chard, love chickpeas and love Tunisian spices! Happy Blogiversary my friend!!! May you have 100 more!!! xoxo I will follow @soumac & share your post on my like page!!! You know I'm in love with Moroccan cuisine ever since I came back from Fes! Love Paula Wolfert's Books! Congratulations on your blogaversery! I've traveled in Morocco and love using my tagine. Can't believe I've never gotten Paula Wolfert's books yet, ack! Really excited to get them and give them a try. I am such a BIG FAN of your FB page, if it was edible, I would have devoured it. I've never tried clay pot cooking, but I'm sure it must help you create fabulous food. Congratulations on your blogiversary! I now like you on Facebook. I 'like" you and shared this giveaway on Facebook! :) Stumbled too! I am following Ms. Wolfert! Reactivated my Facebook for you and Brian! Does Ken have a fan page to? I was just chatting on Twitter the other day about getting a clay slow cooker. A friend wanted a non non-stick slow cooker and @SweetSavoryLive found one by VitaClay. It brought back memories of a dear Turkish friend of mine who opened a restaurant called "Clay Pots", in Melbourne, Australia and makes the most divine clay pot dishes and awesome mezze dishes as well. The cool thing he used to do was give you the whole pot to take home when you got take-out. Plus he used sticky rice in them which was DIVINE!!! I'm sure Paula's book is AMAZING! See you back on Twitter my dear! I love Paula Wolfert and M does, too. It's why I bought him a tagine last year! Would love to get my hands on this new book! And I'm now following Ms. Wolfert on Twitter, too! This doesn't have to count as an entry, but I forgot to say that the Swiss chard and chickpea dish sounds fab & right up my alley! Congratulations on turning a year old. I can't wait for that fabulous opportunity to happen fopr me. As you know I allready follow @foodwanderings on Tritter and on facebook. Plus I just started to follow soumak. This book sounds Fabulous and I would love to learn to cook with a clay pot it would be a great adventure for me and my viewers. Just love the Slow Mediterranean Kitchen! Would love to check out this new book. I'm following you and Paula on Twitter. Great giveaway! And Happy Blogiversary! I have flipped through this book and would love to have a copy! I now follow Paula on Twitter! I have been toying about buying a clay pot for cooking; this would be the perfect excuse to HAVE to buy one! I follow Paula on Twitter! And of course, I've been following you on Twitter! Following both Food Wanderings and Paula Wolfert on Twitter. I've made several of Paula's recipes over the years, and always more than satisfied. Would love a copy of her book! Happy Blogiversary! I have followed you on twitter forever and liked you on Facebook. I am now following Paula! I just have to say, being from Portugal and appreciating authentic Portuguese foods, I love Clay pots! It is truly the best way to cook and I would love a copy of Paula's book! Dear Readers/friends, Thank you for all your comments and wonderful feedback. This giveaway is now closed. Lucky winners are @moonglowgardens & @carascravings. your fiscal challenges inside a preferred certain time period. hours time frame. These loans are typically provided under convenient terms and conditions. here is that they must be a UK resident and of 18 years of age.